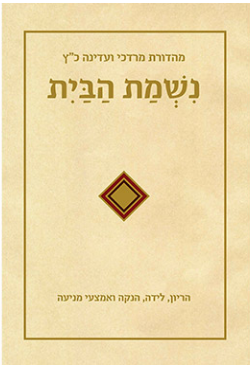 The publication of Nishmat HaBayit, an excellent sefer on Hilkhot Niddah (Jewish family purity law) authored by the Yoatzot Halacha of Nishmat, is noteworthy both for what it reflects about the institution of Yoatzot Halacha and for its positions on particular halakhic issues. This review primarily covers matters of more general concern, and offers comments on specific halakhic positions taken by the volume in an appendix. It is impossible for me to review Nishmat HaBayit without also reviewing the entire enterprise of Yoatzot Halacha. In my role as a shul rabbi, I have worked closely with various Yoatzot since 2011. I have been greatly impressed by the sensitivity they bring to answering she’eilot and the comfort with which women of the community are able to approach these intelligent and well-educated women. Many women are clearly more comfortable posing their intimate questions to another woman rather than asking the rabbi directly. To my mind, this unquestionably improves the quality of the she’eilah and teshuvah process. As a result, since beginning to work with a Yoetzet, the volume of she’eilot I receive may have decreased, but the quality of the she’eilot, the depth of understanding that comes forward in them, and the detailed information that comes together with each question has only increased. This is due to the fact that she’eilot filtered through Yoatzot Halacha, as opposed to coming directly from the woman herself, tend to be accompanied by more detailed information. Hence, I am a strong supporter of Yoatzot Halacha. I have delivered shiurim to those studying to become Yoatzot and personally have benefitted from engaging with them. I deeply admire the knowledge, conscientiousness, and tzeniut of the Yoatzot whom I have encountered, and I believe Yoatzot can be very important role models for our communities, which desperately need female Torah role models. Yoatzot Halacha represent what large segments of mainstream Modern Orthodoxy perceive as the most accepted form of women’s Torah leadership. For this reason, although some in our community (as represented in the OU Teshuvah of which I was a co-author) are not comfortable with Yoatzot for a variety of realistic reasons and concerns, all agree that Yoatzot provide a valuable service to our communities. Nishmat HaBayit gives us a window into the type of scholarship and leadership roles which large portions of our mainstream modern Orthodox community deem to be le-khatehilla. Hence, reading Nishmat HaBayit not only offers dry scholarship and pure Talmud Torah but also a glimpse of what it is about Yoatzot that has allowed them to gain such strong support from large segments of our community. The volume provides genuine information, real sources upon which to base my deep satisfaction with the institution of Yoatzot, beyond personal interactions and impressions. Any comments or criticisms I have in this essay merely reflect minor points of detail that are intended in the spirit of lehagdil torah u-leha’adirah. Nishmat HaBayit is not a traditional work of she’eilot and teshuvot relating to Hilkhot Niddah and one who reads this sefer expecting to find such a work will largely be disappointed. Each section in this sefer is comprised of three parts: a she’eilah (question), a teshuva (response) and a harhavah (extended analysis). The she’eilah and teshuvah are quite different from what one would expect from the standard model of each. Unlike standard she’eilot u-teshuvot, which are often impersonal probing essays, the questions presented in Nishmat HaBayit are first person accounts. One woman discusses her difficulty obtaining clean bedikot after miscarriage (#24); another asks about her lack of interest in having sexual relations after childbirth (#26); yet another writes of challenges due to staining that result from her choice of birth control (#42). The questions are not theoretical; they are personal and intimate accounts. The teshuvotgiven to the questions are similarly very personal and are written with great sensitivity. Rather than a discourse weighing various shittot of posekim, we read a personalized set of directions addressed to the woman. Often the directions involve clear medical information and they frequently present practical options for what can be done to avoid this problem in the future. Almost always, they present a brief but clear set of halakhic guidelines. These teshuvot differ from classical ones in that they most often do not present new analyses of the sugyot, or a careful weighing of different positions among posekim. They do not present extensive argumentation rejecting a proof brought to buttress a particular opinion. The essays in Nishmat HaBayit read like the advice given by a sensitive and expert rabbi or halakhic adviser with abundant experience who thoughtfully and sensitively advises a congregant, rather than simply and dryly answering her question. The harhavah section, which presents more elaborate explanation, does at first glance resemble traditional teshuvot. Notably, Nishmat HaBayit is not the product of a single author. Many Yoatzot were engaged in the project and each siman in the sefer identifies its primary author. It is no surprise, then, that the harhavah section can vary widely based on the author, as one might expect for a sefer of this nature. Rabbanit Chana Henkin herself authored the most elaborate and detailed simanim (see, e.g., #25 and #55). In these simanim the harhavah most clearly resembles a traditional teshuva that begins with the gemara and works through the Rishonim, finally coming to a conclusion based on contemporary posekim. In contrast, the simanim authored by the Yoatzot often more closely resemble a digest of contemporary posekim rather than a full discourse. Of course, there is tremendous value in digests. Halakhic decisors who are looking for the most contemporary information and may not often have access to the burgeoning literature found in Israeli Torah journals will certainly benefit from the summaries of major discussions. It may be that the reason Nishmat HaBayit is not a traditional work of teshuvot is fully in line with the mission and purpose of Yoatzot Halacha. The teudah issued to Yoatzot does not describe them as posekot; they are, rather, “the first address for women who desire to turn to them in matters of niddah and tevilah, who receive direction in the path of Torah and yirat Shamayim.” In other words, Yoatzot are not intended to be posekot—those who themselves decide halakha and weigh in on complicated matters, but the first address one can turn to, if so desired. This framing may contribute to the fact that mainstream Modern Orthodox communities are largely comfortable with Yoatzot Halacha. Some of the most valuable information in this sefer relates to previously unpublished positions of leading rabbanim. Simply having these positions in print is a major accomplishment; however, there would be real benefit in reading the reasons behind these pesakim. I would be very interested, for example, in understanding why Rav Yaakov Wahrhaftig is only strict regarding bleeding that comes from the uterine wall in cases of placenta previa (see p. 51 n. 15). Similarly, in cases of necessity (a term left undefined), Rav Wahrhaftig is lenient in the case of a yoledet after forty days of gestation when the ultrasound indicates that fetal demise was before forty days, without explaining his rationale. We are treated to a number of important pesakim given by Rav Yehuda Herzl Henkin as well. (See, e.g., p. 140 n. 93) Hopefully he will have a refuah sheleimah, and we will benefit from a more thorough presentation of his positions by reading of his analysis and proofs. An extremely valuable part of Nishmat HaBayit is the section dealing with questions of contraception. Nearly half of this volume (144 out of 305 pages) relates to the general permissibility of family planning, under which circumstances it is permitted, and which methods may be used. In my view, providing such attention to these issues is very appropriate, as the bulk of the more complicated niddah questions I am asked relate to questions of staining or bleeding that accompanies contraception. The authors of this volume clearly follow the approach that a couple should seek the counsel and direction of a religious authority before deciding to go on birth control (#30). Although not referenced in the book, this is the position of Rav Hershel Schachter as opposed to others who call for a more limited rabbinic role in this area. The positions taken in Nishmat HaBayit in general, and specifically with respect to questions of contraception, are very much within the mainstream range of halakhic positions. This is yet another reason why Yoatzot Halacha are becoming increasingly accepted in the mainstream Modern Orthodox community. It is worth noting, as Nishmat HaBayit does in passing (#38, p. 200), that with technological advancement and the emergence of newer methods of oral contraception, which often contain a lower dosage of hormones than previous methods, staining and breakthrough bleeding is only becoming more prevalent for women on the pill. As such, the assumption made by the vast majority of modern day posekim that a woman on the pill is a mesulleket damim (a woman who is halakhically presumed not to see blood) may be open to challenge, and it may be necessary to update the information with the passage of time. The book’s ranking of halakhic and practical preference for various forms of birth control (#32) is extremely valuable. This volume also contains discussion of some of the newer forms of contraception such as Nuva Ring (#48,#49), female condoms (#33, p. 184), the morning-after pill (#36), and the sponge (#34 p. 186). These chapters will certainly be of tremendous value to all those who are asked questions regarding the permissibility of contraception. Finally, the most important part of the sefer may very well be the medical appendices in the back. These appendices, authored by Yoetzet Halacha Deena Zimmerman, herself a medical doctor and the author of a highly recommended popular work on Hilkhot Niddah, present extremely valuable information in a clear and precise way. The decision not to print a picture of female anatomy in the sefer but instead (at p. 310) to send the reader to a website that has that information seems to be a proper choice and is in line with the Yoatzot’s overall commitment to tzeniut. The section describing methods of birth control is extremely helpful, although this section would be better served if it had more English translations. There are a few things I would like to see from future editions of Nishmat HaBayit, to further improve an already excellent work. At times the reader is not certain who authored particular sefarim cited in the text. The mafteah (index) in the back of the sefermerely lists the author’s name, but does not provide the valuable information regarding when and where the author lived. Moreover, since many technical terms are presented, a glossary translating these terms into English could be of tremendous benefit for the English-speaking public. Of course, a full English translation of the work is a major desideratum. I can only hope that future volumes of Nishmat HaBayit appear and cover major topics that are not discussed in this volume. Specifically, I await a volume that discusses harkhakot, bedikot, vesatot, infertility, and questions of hatzitza and tevilah. All in all, this is a wonderful volume. It properly attests to the contributions that knowledgeable women can make to Torah. These women offer deep sensitivity, as well as thorough knowledge of both the Halakhic and medical aspects of niddah. It is no wonder that Yoatzot Halacha can play such an important and appropriate role in our communities. Beyond the general comments regarding the book and its value, this appendix considers the halakhic content of this sefer closely and offers a few comments which I believe are important le-halakhah. First, I would like to focus on two issues regarding harkhakot (distancing between husband and wife during niddah) which come up in this sefer. The book summarizes an extensive discussion in posekim as to the permissibility of parents passing a child during the niddah period, but it leaves out the notable position of Rav Mordechai Willig permitting passing a child whom halakha deems to be a holeh she-ein bo sakana. The approach of Nishmat HaBayit allowing for the husband to be present during labor and delivery is, however, certainly well-founded and is based on the position of Rav Moshe Feinstein. Surprisingly, Nishmat HaBayit goes so far as to present the position of Rav Shlomo Dichovsky that a husband may wear surgical gloves and physically assist his wife during labor, which has largely been rejected by major posekim. At times, it is hard to understand how a particular conclusion is arrived at. In siman #15, Nishmat Avraham is quoted that it is unheard of for a woman to undergo a Cesarean section and not have any vaginal bleeding, while the next sentence asserts that if there is no vaginal bleeding she remains tehorah. If medical evidence exists that today some women undergo C sections without seeing even a drop of blood, that should be cited. This is even more noteworthy since the authors of this volume follow modern medical knowledge over the past prior consensus of posekim. For example, in the case of stripping of the membranes, the consensus of the posekim is that it renders a woman a niddah. However, here the author writes that not all scenarios of stripping the membranes are equal and a doctor should be consulted on each particular case (#11). Rav Moshe Feinstein was of the opinion that once a woman tests positive for pregnancy she need not be concerned with vesatot. The author tells us that although Rav Moshe’s position is in the minority, in a case of urgency, such as when her husband is going away for a month of reserve army duty, his position may be followed, as one may follow minority positions in extenuating circumstances (#2). I am concerned by this presentation, as the definition of extenuating circumstances (she’at ha-dehak) is a very broad topic that has implications for many areas of halacha. I would generally be hesitant to put into print leniencies that apply in a she’at ha-dehak, given the concern that this position can open a Pandora’s box that may, God forbid, lead to excessive and unfounded leniencies. To be clear, I am not questioning the legitimacy of this ruling. However, I am contending that we would be better served by a different analysis that might arrive at the same pesak. In fact, such an alternative analysis is already alluded to in the footnotes (n. 18), which refer to posekim who permit having relations during a time immediately prior to a woman’s period when her husband is about to embark on a journey. If this is a critical component of this particular ruling it should be spelled out in greater detail. Additionally, the sefer does not clarify which particular veset we are dealing with: Is the issue at hand a veset kavua, eino kavua, or onah beinonit? Is the case one in which the couple could only be together on the actual onat ha-perishah, or is the issue that they could be together after the onat ha-perishah and the woman is merely concerned that she will become asurah if she undertakes a bedikah. If the issue is the latter scenario, and the case at hand is a veset she-eino kavua, there is certainly room to be lenient based on the position of the Beit Yosef that one need not do bedikah even le-khatehillah for a veset she-eino kavua. Perhaps the most common and challenging question that arises in hilkhot niddah is how one distinguishes between a flow and a stain. It is widely assumed that any niddah flow is a de-orayta concern, whereas a stain is not, and its repercussions can be averted with the leniencies of ketamim. This issue is discussed by Nishmat HaBayit (#42), but it does not provide a precise definition of what is considered a flow. At times, even the harhavah section could benefit from more information. For example, in a discussion of a woman who needs to go to the mikveh while pregnant, we are correctly told that the woman may shower rather than bathe as part of her hafifah process and that she may dip a single time rather than the multiple times Ashekanzic women usually dip (#8). However, no clear guidance is provided as to how long she should spend in the shower as part of her hafifah process, nor are we told when she should recite a berakha if she decides to immerse only a single time. In sum, as with any work of halakha, there is legitimate room to question specific positions and bring larger issues to the fore. My hope is that those who read Nishmat HaBayit will similarly contribute to this conversation lehagdil Torah u-le-ha’adirah. The author would like to thank Rav Daniel Feldman and Yoatzot Halacha Atara Eis and Dena Block for their helpful comments. Although the Hebrew title page and cover do not assert that Nishmat HaBayit is a work of teshuvot, the English translation terms the book a work of responsa. The paucity of she’eilot related to niddah in Be-Mareh ha-Bazak is largely, I presume, the result of those who would otherwise ask Eretz Hemdah rabbanim turning to Yoatzot Halacha for guidance in matters of niddah and fertility. The teshuvot in Be-Mareh ha-Bazak are far more impersonal and present what the Halakha is in a terse, laconic manner. We are told that experts were consulted in questions of fertility. However in Nishmat HaBayit the responders present a more elaborate response and they themselves serve as experts on various medical issues. It is noteworthy that Rav Moshe Ehrenreich the Rosh Kollel of Eretz Hemdah makes precisely this point regarding the sensitivity to the questioner in his approbation to Nishmat HaBayit. The inclusion of medical information distinguishes Nishmat HaBayit from other contemporary works on Hilkhot Niddah. The volume could benefit from more cross referencing throughout. For example, in Rabbanit Henkin’s extensive presentation of hargashah discussed in siman #25 there is no reference to Rav Wahrhaftig’s unusual position that women today are not niddot mi-de’oraita since they do not experience any of the hargashot mentioned in posekim. Rav Wahrhaftig’s position is mentioned, however, in siman #42 note 9, although there is no discussion in siman #42 whether, according to Rav Wahrhaftig, blood absent hargashah will be treated with the leniencies of ketamim. Although there is great need for digests and many find this style compelling, my personal preference is for a bit more conceptual analysis or lomdus. See my earlier Lehrhaus article on this topic. My translation of the text of the teudah given to yoatzot halacha upon completion of the program. See #22 page 116. I am particularly curious since when I discussed this question with a number of posekim I was told to be strict on the matter. Rav Henkin is uncertain regarding this situation. I am curious as to how the Yoatzot would decide in a dispute between Rav Henkin and Rav Wahrhaftig. Such disputes are not entirely uncommon. It is worth noting that elsewhere in the volume innovative shitot of Rav Wahrhaftig are explained. See #39 note 23 where a rationale for Rav Wahrhaftig’s position that a woman need concern herself only with the last day of what the package of birth control pills defines as the most likely time for her to receive her period. See Herschel Schachter, “Halachic Aspects of Family Planning,” Journal of Halacha and Contemporary Society 4 (Fall 1982), 5-32. Moshe Kahn, “The Halakhic Parameters of Delaying Procreation,” Meorot 8 (2010), p. 72-82. See Deena Zimmerman, A Lifetime Companion to the Laws of Jewish Family Life (Urim Publishers, Third Edition, 2011). See #29. An interesting but unsourced point is made in this siman, that the minhag of kvatter at a brit milah developed as a way of ensuring that the parents do not pass the baby directly from one to the other. See Toharat ha-Kodesh, p. 314. This is particularly striking since Rabbi Willig is cited in #29 n. 25. It is possible that the authors of this volume failed to notice the significant comments of RIETS Roshei Yeshiva in the back of Toharat ha-Kodesh. Iggerot Moshe vol. 2 no. 75. However, Rav Moshe goes even further than Rav Yehuda Herzl Henkin and states that even if the wife does not see any need for the husband to be present there is no issur. Surprisingly, this teshuva is not cited in the text. See Baddei ha-Shulhan, millum 190:53. Even Israeli posekim largely accept the 19 mm shiur. See Piskei Teshuvot, Yerushalayim 2007 p. 230 n. 67 in the name of Rav Elyashiv. See Shabat ha-Aretz, introduction, ch. 10. I delivered a shiur to aspiring Yoatzot Halacha on how one can assess she’at ha-dehak specifically with respect to niddah issues a number of years ago. The shiur can be accessed here. This is in fact the conclusion of Rav Mordechai Willig—see Toharat ha-Kodesh, p. 314. Rav Willig is quoted differently in Nishmat HaBayit #55 page 271-272. However the citation in Nishmat HaBayit does not seem to conform with Rav Willig’s conclusion. If the authors want to rule leniently only because of the pregnancy, this should be stated explicitly after referencing the discussion in #55.